Two weeks ago when I set off on my last hunt, I started to sing as I was driving my truck, rolling up and down over the hills on the road. It was liberating, heck my window was all the way down and I was singing so loud. I am sure I looked quite silly but this mattered not. I believe there is more to it, then just the song and the joys of singing. I was asking the powers to be all around me to provide a great harvest and positive vibes. Almost like a prayer, after all there is no shame in this. The words go like this “Oh Lord of the skies give me a great harvest, give me a Canada Goose, or a Mallard Drake or maybe a Green Wing Teal” Then I go on asking for solid shooting and good wishes and about how thankful I am about being able to hit the wetlands, all the while trying to rhyme, so that it sounds fair. You know the darn thing is, that it seems to be working, and I think I shall continue this new tradition of mine. Anyhow today was an exceptional day in the snow, it was so mild with the temperature sitting at about five degrees celsius. The wetlands were simply incredible. And once again I was all alone, absolutely no-one. Like I wrote in my earlier blog entry, as soon as the deer season is over, and the winter moves into the forest along the river and the nearby wetlands the area becomes deserted. I don’t understand it, because there are less geese no doubt but the duck season is still open for until the start of the month of January. There was a slight rain fall and the fog was starting to move in by early afternoon as I made my way to the pathway between the bays. The pass was almost all frozen over because normally the water level comes up to your waist and in some places even higher and you have to wade through the water carefully because there are sometimes 2 x 4’s with nails from blinds that were built the year before. There’s a local beaver that has moved in and began building along the pathway, which now makes it easier because it makes a land bridge. Today was incredibly mild and as I was walking through the pass I can see the cranes takeoff and fly away from their nearby nests. My objective was to get to my new hunting spot where I’ve been before, this spot is quite beautiful but the most strategic part about it is that there is an opening from the river which leads to a large creek that moves inland. Mergansers and Mallards seem to like this spot and if I call properly, they usually come in flying or swimming along. There are also large trees that create a natural fence line between me and the river, so on my way up to the natural blind, I can jump shoot all the way along. Mergansers will fly in and then dive under and look for food, this is the perfect time to move into position from large tree to tree. Then when they resurface, I freeze and hold, then when I get close enough, I jump out and they burst into the air for a quick harvest. Within the first two hours I had harvested two birds. The tricky part was retrieving the birds when they fell back into the cold waters, the ice sheets attached to the shore were already several inches thick and when I stepped out onto the ice I would break through to my knees, this was no problem but when the current brought the sheets of ice back in, they would crash into my shins. So, I leaned forward and pushed them off, some pieces were as large as a dining table, now two birds in the bag by mid afternoon the fog started to thicken and was quite a sight. The black tree trunks and branches would zig zag through the fog like veins in an arm and it was quite something to see, my gut instinct was telling me that it was now time to start making my way back to the truck. I still had about a forty minute hike through rough terrain with water traps. Besides, I was not alone there were three large coyote paw marks and no other human boot tracks to be seen. As I broke the tree line and headed toward the bay, I swung around to look back at the forest and it was completely engulfed with white fog. This sight would make the hair on any man’s neck rise. My inner senses and timing could not have been any better, it was as if the wilderness was closing its doors on me, even with time to spare before legal shooting time was over, the message was clear. Once over the beaver dam, I started following another smaller creek along the way, attempting to jump shoot one more duck before the end, but as I made my way north, my eyes spotted a white tail and slight brown colour moving lightning fast along the water edge. It was a cottontail, I swung around instantly and the rabbit took two more hops and dove into a bush with just its hind legs coming out the back. I released my shot and it was all over in just a few seconds. I was so excited to retrieve the Cottontail, I unloaded my 870 and leapt through the creek right over the bush and just about fell over in the snow and mud. There is no better way to end the day, it is moments like these when we can truly take the time to appreciate what nature has offered and it makes up for the times that one can be discouraged and have doubts in one’s abilities as an outdoorsman or outdoors woman. I wish you all the best on your back-end of the waterfowl season and a great small game season! It was the middle of the month of March now and the sun was extremely bright and very high in the sky almost directly above me and only a few minutes shy of high noon. The day was an amazingly warm wintery day, I could feel the warmth on my face and I had already stripped down a layer. The reflections from the sun transformed the surface of the snow into a very large mirror, with the temperature sitting at around one degree Celsius. I had been tracking snowshoe hare and a coyote tracks for the most part of the morning. I made my way down the ridge to the north-west heading south and followed the coyote tracks right through the frozen swamplands then over the river and afterward headed to the south-west. The coyote tracks would be occasionally space out, at times you could only make out three paw marks and then there were gaps of about a meter and a half or so in length as the animal would break out into a trot; then around the thirty meters distance mark it had stopped at a watering hole very close to the beaver lodge and then it climbed up on a large boulder to have a better look around. The coyote then continued around the front of the rock formation on the southern edge of the forest and disappeared in the snowy cedar and pine. 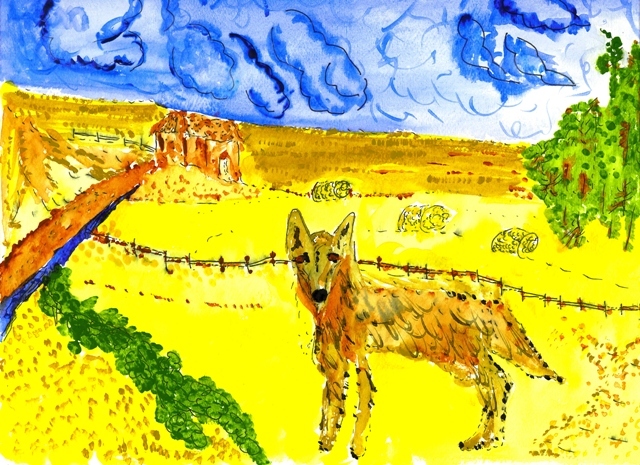 It is incredibly rewarding to be able to read natures signs, almost like a book and piece together a story, of this lone coyote who roams the same pristine lands as I. The snow surface had hardened from last night’s freeze creating a thick crust of ice thus making it much easier to walk. Every few steps one of my boots would break through and after a few tough steps I would stand steady onto of the surface once again, just like the other creatures which were lighter than me. My goal was to harvest a snowshoe hare but I was also on the lookout for the intelligent American Crow. Another hour had passed and once the snowshoe hare leads had gone dry, I put my focus on the Crows which were flying around to the north. I followed them as they flew over head; which lead me directly into the bowels of the white wilderness and within minutes I was surrounded by trees and pure solitude. There was a small clearing in between the pine and maple trees, so I made my way to the opening and looked up through the tree canopy to the bright blue sky. I let out a few crow calls using my hands also adjusting the shape of my mouth and within a few minutes some crows flew right over me but were too high to reach with my 870, then the murder circled away to the west. I leaned up against a large tree and used its branches as cover because I remembered that during one of my previous pigeon hunts, the birds saw me from above and by the time my shot rang out they had maneuvered around my pellets. It was incredible! A few more minutes had passed and now I was turning around to start my way back to the farm when all of a sudden I heard a crow call out from above, I was able to tell right away the direction he was calling from even without having seen him yet and knew he was going to fly right over head in my direction. I swung around one hundred and eighty degrees shouldered my shotgun did a quick visual check, released the push safety and shot all in one single motion and hit the crow directly in flight; he landed directly to my left only five meters away. He was a beautiful bird and it had almost as much meat as a teal duck. It was a great hunt and feast! My theory and belief about the approach may not always apply to all forms of bird hunting, but it is most definitely linked to all other types of game such as hare, fox, coyote and more so with big game like deer. So, what do I mean by the approach? We are all aware of the use of stealth; scent free clothing or products of that nature, as well as the necessity of wearing camouflaged clothing. Yes, the way we walk through the wilderness is part of the approach but it is not just about trying hard not to be noticed. There is much more substance to the approach, more depth if you will and I know that it is not just about your clothing or stalking techniques. In fact, it is almost found at the spiritual level. You might say “Oh! No, he is writing about the warm fuzzy stuff.” Not at all, it is about the state of mind in which the person is in, the sense of awareness and the hunter’s ora. To me anxiety, nervousness’s, impatience and lack of confidence or faith in your abilities as a hunter will spill like a bad energy beyond the boundaries of your physical being and animals will smell, taste and feel those energies and if detected you might end up spending the entire duration of your hunt without seeing a single living thing. On the second evening of my duck hunting season, I met up with a veteran hunter and good friend of mine who has been deer hunting for the past three decades. He is what I would consider an elder, the real deal and his presence is about as pure as the province of Quebec can produce. He shared stories about his youth and how impatient he was as a young hunter sitting in his ambush spot in the woods; he spoke of his frustration that would spill out if a deer did not come by within the first few hours of the day. His father who was an experienced guide, taught him to shed these negative energies, it was a type of meditation, clearing his mind and imagining the perfect hunt while he was sitting in his ambush site. He would imagine and create the hunt that would unfold in front of him. He told me that he would raise his arm like a rifle and point his hand toward the opening in the woods or the edge of the field and let his imagination run and more often than not a deer would appear within a few hours and when it was a trophy buck he took his shot and harvested. I once read a book about a bow hunter that would take the time to sit by the road and leave all the stresses of the city behind and then when he felt ready to hunt, he would get up and off he went. For me, it starts during the drive to the site; I turn off the radio and try to think about something other than the hunt. Sometimes, at the start of a hunt with my good tracking friend we normally take the tobacco out of a cigarette and do a sort of offering by spreading it around our starting point. Like I have written about many times, it’s not about having hundreds of trophies in your den, or sharing over exaggerated war stories, it is about keeping the hunt raw and I do not consider a meditation ritual one bit silly. In two days, I will be heading back into the woods and I can barely contain my excitement. I will have spent almost the whole week preparing my gear and rifles for the day trip. It is very difficult to describe this strange magnetic draw I feel toward the wilderness. In Dianne Macmillan’s book “Life in a deciduous forest” she writes about energy and how it is transformed into food when it pertains to the relationships between the sun, the North American biome and its ecosystems, which also include wildlife. It is all it takes just a few hours in the woods and I am able to grasp the balance I need. Although the majority of us live in urban areas, we are very much part of the link and this relationship that the author writes about, futhermore at the end of the book she provides websites and suggestions on activities and practices that are great for the environment. 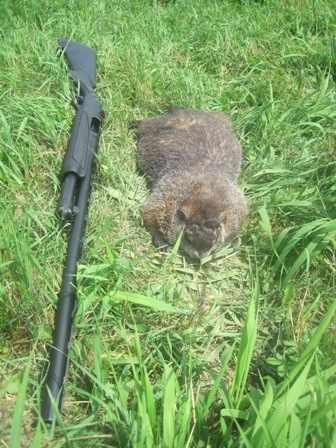 This blog is not just about small game and varmint hunting but also about conservation, if you leave a room -shut off the light. This simple yet great gesture will indirectly affect your hunting environment in a positive way allowing you and future generations to benefit from the wilderness as well. I highly recommend this book as it was an enjoyable read, so much so that I finished it in just two hours. The book is extremely informative and helps you better understand life in a deciduous forest and there are some great points about its wildlife such as the black bears, ruffed grouse and other small game. Education and awareness are key, thank you Dianne!